Let’s say you happen to wander through the Shepards’ East Chop backyard one fine summer day. This is possible since there are two footpaths that bump up against the property. Or let’s say you happen to putter up the long single-lane gravel-and-grass road to their house, tucked back in its own verdant oasis. Either way, you might be startled by a couple of legs sticking out of a hedge, or a blonde head bobbing behind the butterfly bushes and zebra grass. 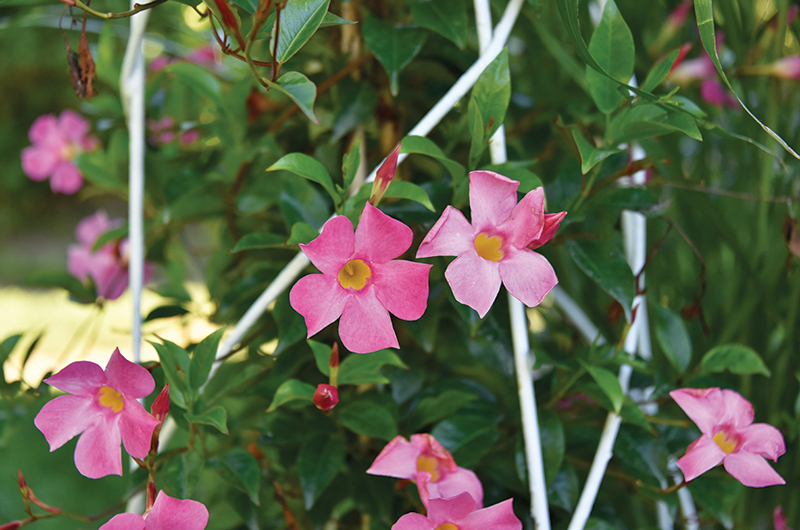 You might even see a pair of seemingly handless hedge clippers waving madly, Edward Scissorhands–style, behind a stubborn mass of trumpet vine. On closer inspection you’d find a tanned man in shorts, a bit sweaty, a pile of trimmings or nursery plants at his feet, perhaps a spade or a hose in his hands instead of the hedge clippers. It wouldn’t matter if you were there at 6 a.m. or 6 p.m., because J. Powers Shepard would be out in the garden working. J. Powers Shepard hard at work on his East Chop property. His wife, photographer Jeanna Shepard, confides that J., as he is known, is out there so much that he almost disappears into the landscape, and that she can’t always keep track of what he’s doing. Jeanna, who’s not exactly low energy herself, can leave the house, do three or four photo shoots all over the Island, and come back at the end of an afternoon only to find a new arbor built or a new stone path laid – or sometimes an entirely new garden vignette created. J. is a self-described Type A. “I’m always doing something,” he admits. “I build furniture. I play a lot of sports – golf, tennis. I still play hockey three days a week.” Oh yeah, he’s also an executive director with the investment banking company Morgan Stanley. But press him a bit and he reveals that his father, who died when J. was eight years old, was an avid flower gardener. J., who grew up in Montclair, New Jersey, doesn’t remember the gardens as much as he remembers his mother talking about them, but he does know his father called his garden “A Riot of Color,” a name J. and Jeanna have adopted for their own garden. Or, more accurately, gardens plural. In 2010, when the Shepards bought the East Chop cottage they had rented for thirteen summers, there was no driveway, no front yard, no landscaping. Just the usual overgrown weeds and scrub suitable for a summer house mostly used as a rental. As soon as they became the owners they immediately began clearing and planting around the three-quarter-acre property. While a magnificent perennial border, more than 100 feet long, is arguably the focal point of the landscape, J. has gone on to dig beds and design mini-gardens all around the edges of the property. Now that their four children (ages twenty-two to thirty) are grown, the couple can spend almost half the year in Oak Bluffs. 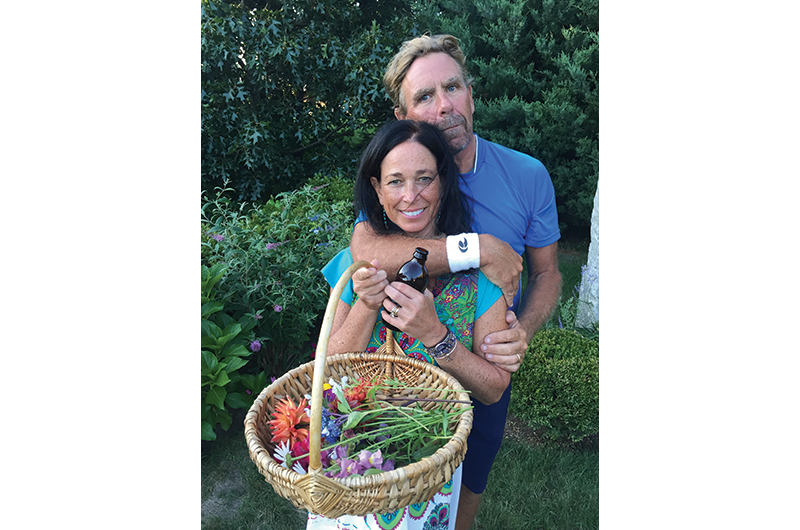 But even when in their other home, in New Canaan, Connecticut, the Vineyard garden is never out of mind. 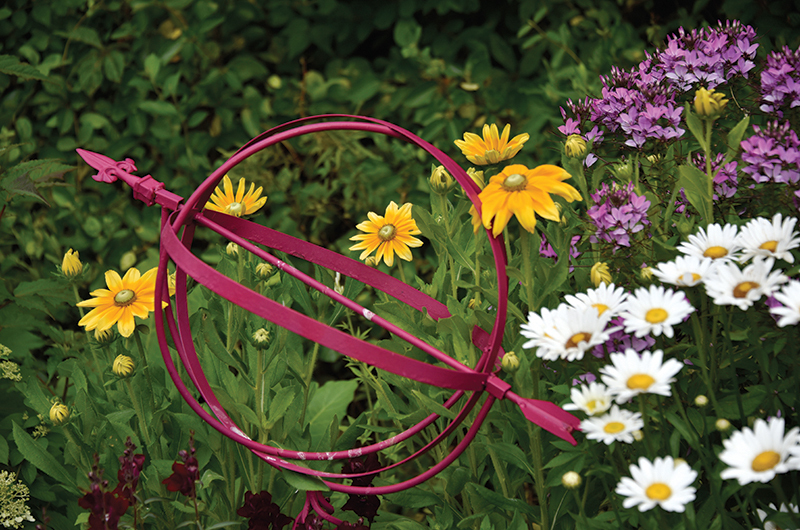 They like to frequent flea markets and antique shops all over Connecticut to look for everything from whimsical metal garden ornaments to birdbaths to granite sculptures. The works of art, slipped in here and there around the property, do what all garden art does, of course: add interest, contrast, relief. But in the Shepards’ case, they also reflect the couple’s fun-loving and welcoming personalities. The garden is a serious endeavor, but not too serious. The Stone of Accord at one end of the perennial border is perhaps the best example of this: a granite pillar with a giant hole in the middle of it through which two parties engaging in business or marriage are encouraged to shake hands in a sign of commitment. And then there’s the color. You’d have to be blind to miss this clue to the light-hearted nature of the gardens: there are masses of colorful blooms all over the place, regardless of the season. Perhaps the most stunning is the cascade of purple in spring when the now-mature wisteria vine hanging from their second floor deck blooms and seems to cover every surface under it. The effect is so boisterous that the Shepards have taken to calling it “wisteria hysteria.” On either side of the wisteria, the orange blooms of the tenacious trumpet vine lurch back every year despite the aggressive pruning J. gives them. With no formal garden training, J. approaches color and design by buying what he likes. He frequents Island nurseries from spring to fall, picking up plants while they’re flowering so that he’ll know what they are going to look like. He plants fearlessly, knowing something might not work or make it. Trial and error, gut instinct, personal aesthetics – judging by the pleasing and well-kept nature of the property, this approach seems to work for J. To handle the enormous demands of the perennial border, he has hired Renee Clermont of Second Nature Designs. Every summer she evaluates the perennial mix of roses, coneflowers (echinacea), grasses, salvia, hydrangea, and other plants: some must be divided, some deleted, and always a few new plants added. 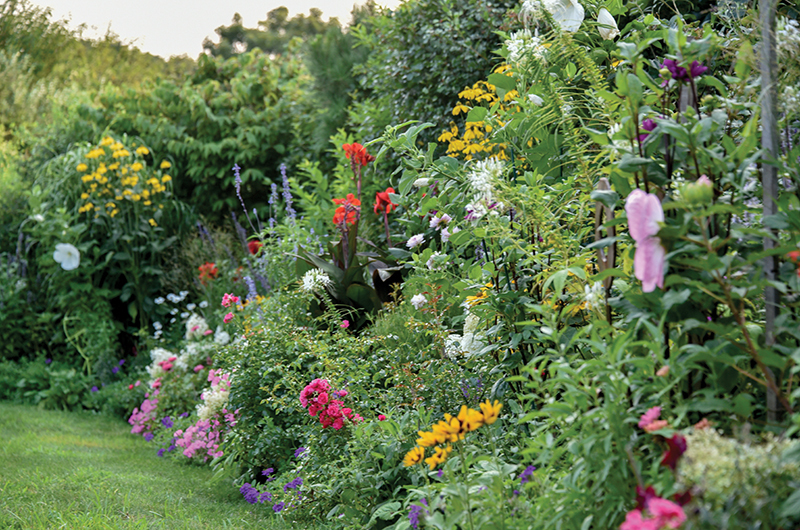 Then she augments the border with annuals like sunflowers, cosmos, zinnias, dahlias, snapdragons, moonflowers, and cleome. Height, texture, and time of bloom are important. But the goal is always a riot of color. Jeanna and J. Powers Shepard. Even with Clermont working on the border, J. finds work around the entire property has to be a daily commitment. “If I’m away for three or four days,” he says, “it all goes to hell. You’ve got to stay on it.” He fertilizes frequently and has installed a drip irrigation system in most of the gardens. Over the years he has reframed the property by planting pines, rhododendrons, Montauk daisies, boxwood, and hollies. He’s created a front and back lawn, installed granite steps up from the driveway to the back entrance of the house, and, in the process of updating the house, created a small tool shop in part of the old garage so that he can drag his sawhorses out into the driveway on a summer day and build or repair whatever is needed. A 2017 addition to the property was a Zen garden along the road to the house, across from a small stand of crapemyrtle, which he laments has been underperforming in the bloom department. Last summer he targeted another spot along the road. “Something just came over me and I just cleared a bunch of stuff out and put in these arborvitaes, these zebra grasses, and those coneflowers. And a little sundial.” The combination works and the space feels like a little outdoor room. Perennials of various height, texture, and color commingle with select annuals in the 100-foot-plus border garden. His next project is to widen the driveway and build a new stone border along it. One has the feeling that won’t be the only project for the man in constant motion. If you see his yellow 1948 Willys truck driving by, the bed full of Shasta daisies or black-eyed Susans or purple asters, you’ll know he’s at it again. Or you might see him walking down the street to a neighbor’s, bouquet in hand. He tries always to arrive at dinner parties bearing a bouquet of garden flowers, and he’s even done the flowers for friends’ memorial services. As for Jeanna’s take on all this, she smiles and says, “I love it.” She’s especially enjoyed photographing the garden as it has transformed over the years. A few years ago, she put together a thick book of garden photographs and gave it to J. as a Christmas present. Of course the book is titled A Riot of Color.